2 cents regarding flatbread pizzas. I will begin with the flatbread pizzas because it’s a great way to introduce the technique. So let me get it out there: I LOVE flatbread pizza. I am a flatbread pizza junkie. I think they’re completely artisianal/handcrafted food, delicious, elegant, and really give a chef room to explore his creativity. Just think of all the fun little things you can add to a flatbread pizza, that wouldn’t necessarily work on a traditional pizza. It becomes gastro-pub style food, tailored for the best wine bars, and can showcase excellent market ingredients, techniques and skill. They can also be simple. As I have said so many times before, simple done right is usually best. The art of making a flat bread pizza (or ‘craft’ as it may be) is really back – to – the – basics pizza making. You need an exceptionally hot and dry oven (like a wood oven, or a conventional oven with a pizza stone), a great pizza dough or flatbread, high quality ingredients and the know-how to put them all together. No tricks this time. The ingredients vary dramatically, but for this particular recipe, I am calling for caramelized onions as a base. This is really the technique I want to discuss. Caramelized onions vs sauteed onions are tricky to make and require a bit of patience. But the results are worth it. Caramelized onions are exactly what the name implies: Onions cooked until their natural sugars are developed and accentuated through the cooking process. It’s also important to note that they need to be cooked thoroughly. Thus is the difference between caramelized onions and sauteed onions. Sauteed onions usually have a little color on them, but only on the surface. The sugars within are left somewhat untouched. That gives us a stronger onion flavor, which is great, but in this case, we want completely cooked, soft and sweet. The technique is simple: Keep cooking the onions. Keep turning the heat down to prevent burning. When they’re dark and look ready, deglaze your pan with a little white wine or water to loosen them up and extract even more flavor and sugar. Keep cooking them, starting with high heat and ending with extremely low heat. They should smell sweet and should yield about 1/2 the volume you started with. Keep cooking them, that’s all you need to remember. Low heat and time: the onions will get where they need to be, just be patient. Other than that, the recipe is fairly simple and straight forward. 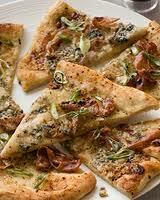 Wonderful Mediterranean flavors heaped on a flatbread and roasted to perfection. To stay in line with the gastro pub ‘theme’, I would recommend serving this as an appetizer along with craft beer or white wine, and some sort of pepper-green salad, like wild arugula, upland cress, mitzuna or tat-soi. In a heavy bottom saute pan, begin heating the vegetable oil. Add the onions and let them fry. As they begin to darken, turn the heat down. Gently stir to keep them rotating. When they are deep golden brown, turn the heat to low, deglaze with about 1/8 cup of water and continue cooking. Keep cooking and stirring until the water is gone. The onions should be deeply colored, completely cooked through and should smell sweet. Remove the onions from the pan and reserve. Heat your oven to 450 degrees F. Drizzle a little olive oil on the flatbread and layer on the onions, followed by the pears, followed by the cheese, and the prosciutto on top. Bake until cooked through and the cheese is slightly browned on top. Remove from oven, drizzle a little more olive oil on top, sprinkle black pepper on top and finished with the parmesan cheese. Slice and serve right away. This dish goes best accompanied with a wild arugula salad with such items as fresh figs, dried cranberries, cashews and shaved fennel. Best served as an appetizer with either a crisp white wine, such as pinot grigio, or an oaky buttery chardonnay.